Hi my name is Teresa Comerford and I am club secretary for KCH Fit4Life. I joined Fit4Life about 9 years ago. I was in my mid thirties and I was very much a novice runner. So when you read that the club is suitable for complete beginners trust me, I was that complete beginner, I did not run as a child if I am being honest I would have been hard pressed to run for the last bus home!!! Why did I join Fit4life? I joined the club with my friend who had recently had a baby and wanted to loose weight, I was an avid walker but like my friend felt I needed to help my waistline along, I joined thinking I will give this a few weeks, she will make a few friends and I will get back to walking the ringroad. I was so wrong, from the first session I loved it. Sean Lynch was so good to us beginners, showing us the proper technique, encouraging us around the track, telling us not to compare ourselves to the others on the track who were lapping us constantly. Over the course of a number of weeks, I could see a progression in my running, I was soon able to run the 400metres without stopping, my first mile timing (4 laps of the track) was a momentous occasion for me personally, I was now a runner…OK a slow one but I could run a mile. Quiet quickly I made friends with a group of ladies who were more or less of the same capability as me and we decided in the June ( I was running for about 4 months at this time) that we would run the Rusty Scanlon 10K that August and we did, I think I was fairly close to last and trust me you could see me for miles with my bright red face but the beaming smile is what I really remember. I had ran 10Kms….. I was 30 odd years of age and I had ran my first 10K, Five months after that I ran my first half marathon! 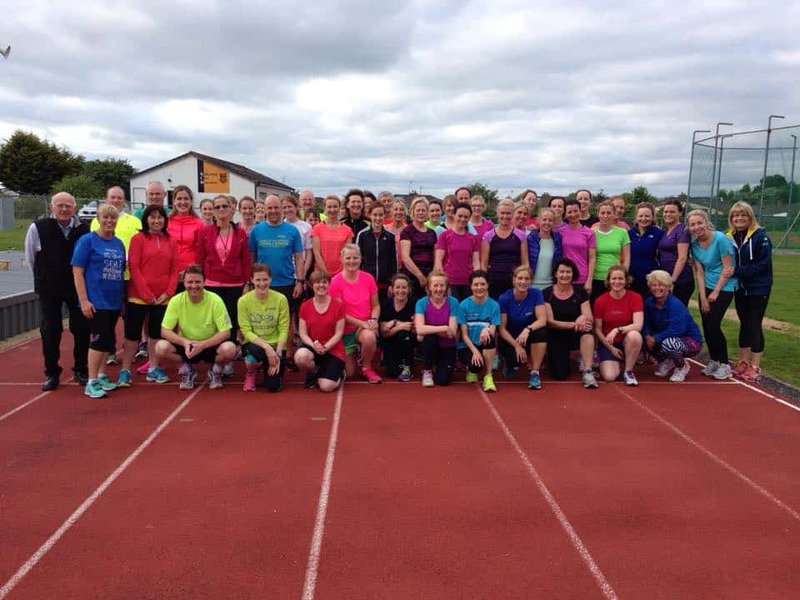 So over the years, what keeps me running, why do I pay my money and re-join KCH Fit4Life year in, year out and with a hand on my heart I can say truthfully it is because of the friendships I have made on that track. I have made some life-long friends that I would have never have had the opportunity to make in my everyday life. It is because of these friendships that I run 3 to 4 times a week whether it be on the roads of Kilkenny or up on the track. I have travelled to so many places including a very special trip to LAS VEGAS to run half marathons with some of the friends I have made. I have been part of many worthy fundraising events throughout the country organised by the running community so I get to give back while doing something I love. What has running brought to my life, so many things, yes I am fitter, healthier, happier (a little bit leaner) but one of the most important lessons it has taught me is that I am tough, when I am out running and I really want to stop that I can push through that mentality and keep going. I can now say I am a marathoner having participated in the Dublin Marathon for the past 5 years. So when you hear from someone oh running is bad for you knees, just ignore them, proper running technique, good runners and a strong core will protect your knees and join up. Running is hard but it is so worth it!! !